Ensure your plants are kept healthy by hiring garden maintenance specialist from us in Crayford DA1. Pick us because we offer reasonable, competitive prices, as well as wide ranging and all-inclusive services, that include garden maintenance and much more. You won’t need to provide any equipment whatsoever, just make your booking and we’ll come ready for the task at hand. You don’t even need to be present at your property during the job. Give us detailed instructions and access to your garden and we can do everything without you there – your convenience and satisfaction are our priorities. Reserve your appointment at any time of the day or night – our advisers work around the clock to help you. It doesn't have to be sunny, as all gardeners are enthusiastic enough to work in all weathers! Garden Design - we can help make your dream garden a reality - you'll be the envy of your neighbours! When you make arrangements for Allan's Gardeners to call, our first step will be to send someone round to appraise your situation. If it's not possible for you to be present when we call this isn't a problem but you'll need to provide detailed instructions. You can put your trust in your friendly gardeners because we've explored their work history and performed all of the necessary checks. For your further peace of mind, we're a fully insured provider. 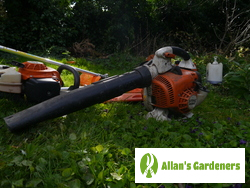 We keep our garden care service ahead of the game by providing all the necessary equipment, products and tools. 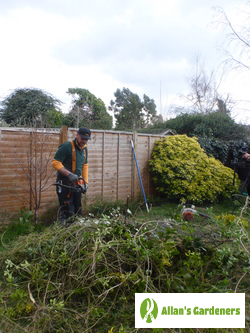 All the highly qualified experts will swiftly transform your garden into a place where you can enjoy your free time. You won't just find Allan's Gardeners in Crayford. We also work in: Gravesend, Sidcup, Bexley, East Wickham, Welling.